You open your garage door, pull your vehicle inside, close the garage door, and think nothing of it until you need to open the door again. However, it is important that you take the time to regularly inspect the foundation of your garage to determine how it is holding up. Most garages are built upon concrete slab foundations, and are, therefore, inclined to crack and settle. Special attention should be given to the status of your garage’s foundation as it is attached to your home and any issue that your garage may have can translate to problems inside the home. 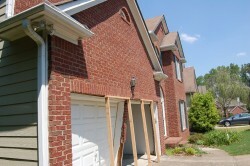 If you notice any signs of foundational damage of your garage (i.e. cracks in the walls, cracks in the floor, uneven floors, separation from the garage trim from the exterior of your home, or stair-step cracks in the exterior brick surrounding your garage door opening) it is time to call in the experts at Anglin’s Foundation & Masonry Repair. Georgia is known for its infamous “Georgia Red Clay” and how it is not the ideal soil for most things. This includes offering structural support to a slab foundation. A slab foundation relies on the soil beneath it to offer support and to absorb tension as the moisture content will fluctuate again and again. Many times homeowners find that the reason behind their garage foundation issues is due to incompetency on the builder’s part to ensure that the quality of the soil is optimal for building. Anglin’s Foundation & Masonry Repair has been helping homeowners and commercial property owners for more than 85 years correct problems with their foundations. Our experts have built our impeccable reputation by fixing the problem and preventing future issues from arising. As John Anglin says, “We fix it for life, the first time.” Anglin’s Foundation & Masonry Repair is dedicated to helping you find the solution you need in order to save your property. Call us today.